It appears that the Wolfson drivers will not be in the next Raspbian update. HifiBerry and IQ Audio I2S devices are supported. No Wolfson support until they submit a PR. I hope someone from Wolfson reads this and follows up. I have a HifiBerry and it's been supported for a while now, at least from the day I got mine, which was a couple of months ago. That's quite admirable considering it was created around November of last year and began selling around December. From my personal experience with it, I can tell you it just works with pretty much everything you throw at it, and it sounds pretty good too. * Hifiberry doesn't sound as good as the Wolfson. The TI 5102 chip doesn't hold a candle to the Wolfson chipset. * It struggles (and often fails) playing the 24/96k sampler music files that comes with the Wolfson card. First thought it was the SD card (Sandisk class 6) not being able to keep up, but the music plays fine on the Wolfson even with a slower SD card (Sandisk class 4). The Wolfson chipset must somehow be offloading the decoding and playing of hi-res music whereas the HifiBerry relies heavily on the CPU. * Hifiberry doesn't have a headphone amp. You must get some sort of amplifer, headphone or otherwise, in order to hear its full potential. * Nor does it have any sort of microphone input - no built-in DMIC, no line input, no SPDIF in/out, just an RCA out. * Hifiberry's a bit more expensive (39 Euros = ~ 45 USD) than the Wolfson (34 USD). That said, however, I am using the Hifiberry a lot more than the Wolfson at the moment because the driver works perfectly, and works well with other software (namely Pulse Audio), which speaks volumes of the importance of software, no matter how superior the hardware is. So, is submitting a PR just a matter of formality, and not a technical hurdle? And if not in the next update, then when approximately we can expect the Wolfson driver to be incorporated? Finally, when it is incorporated, will it work like the HifiBerry driver? As a loadable kernel module that can simply be modprobed? It is supported in the new release of XBMC Gotham Cheers! Would you tell me how to setup XBMC Gotham? Can I install raspbmc-2013-12-23.img first,and update the XBMC? So no need to do anything but get new image or update and existing Raspbmc install. Has anybody actually tried this? If so, could you summarize what needs to be done to make it work? I just installed XBMC Gotham this evening and was unable to get it to work with my Wolfson card. I'll keep looking for links. What is your desired setup with XBMC? Just curious as a $5 USB Sound card card can deliver the same audio quality out. Here's a good understanding of what this card is compared to a USB sound card. https://www.youtube.com/watch?v=VU-JMVkbCP8&feature=youtu.be I am working on a write up as we speak and testing it out. I did see this post on Raspbmc from 4/14/2014 so it is coming I would follow this post and possibly recommend Raspbmc as it the only build I am aware of that is building in support. Please let me know if the other builds also offer support or intend to Raspbmc » New Raspbmc update! Wolfson Microelectronics Raspberry Pi Module – Wolfson’s patches for this had issues, so I’ve done my best to manually resolve these myself. I have reached out to a developer at Wolfson who tells me patches will be released in the future. The Wolfson audio card doesn't work with the official raspberry pi kernel, and their patches don't apply to the current kernel tree (you have to apply them to a tree from before Christmas).I think your only possibility is to use the supplied sdcard image they distribute, and then follow this:http://www.raspberrypi.org/forums/viewto...61#p520212to get raspmbc working. Note, this is a hack and you will find things that don't work (e.g. updates), but I don't think there is a better solution for now. Post found How do I get a wolfson audio card working in Raspbmc? Element14 or Woolfson Do you have a comment on this. At the moment I cannot use the card I bought as I need to run it with the current Kernel. I think in order to be of any assistance what requirements do you exactly need. What benefits over the older Kernel would you receive vs building it off the newer Kernel. (Note newer Kernel does not always equate to making your project better. Need to see what improvements were made.) Yes there does need to be integration into the default Raspbian images, etc.. But there are almost always options available through a Google search where work outside an official release results in what you need. By defining why you need to run it with the current Kernel they can answer if any updates that do come out will address your particular need. The Woolfson card is just part of my system. I need to keep other bits up to date. Having a system where I cannot run apt-get update and / or raspi-update is unacceptable. You have identified one problem raspi-update? I am not familiar with this I am going to guess you meant rpi-update. rpi-update will update you to the development Kernel. This is not intended for general use. But for the Linux dev's to test out the newer builds to see what bugs need to be discovered before being released into the general public. It's an advanced update utility and I strongly discourage anyone from using it if they want the most reliable tested kernel running on the Pi. "As others have commented, rpi-update is useful if you want the latest, latest, latest version of the firmware, but does carry with it a few risks to the stability of your system." This is why you will see files inside this firmware being updated almost daily. Yet the official image is released only a few times each year. Updating for the sake of updating is never recommended unless your willing to post what issues you encountered and downgrade or help resolve the issues with the new firmware. No developer should be blamed if raspi-update causes a conflict as they may have just barely downloaded it and began to work on a resolution. kernel: Bump to 3.12.19 is Three days old just how fast a resolution to a developers hardware or software is acceptable? apt-get update doesn't actually install new versions of software. apt-get update downloads the package lists from the repositories and "updates" them to get information on the newest versions of packages and their dependencies. It will do this for all repositories and PPAs. Used to re-synchronize the package index files from their sources. The indexes of available packages are fetched from the location(s) specified in /etc/apt/sources.list. An update should always be performed before an upgrade or dist-upgrade. apt-get upgrade will fetch new versions of packages existing on the machine if APT knows about these new versions by way of apt-get update. If using apt-get upgrade. Always pay attention to what packages have been updated and report a package that has possibly broken a known working feature. Again downgrade that app and await an official update. What is holding up the PR Documentation the Foundation needs is unclear and yes Wolfson should act as quickly as possible to get their card into the official Current Release of Raspbian. But as we are unaware of what steps they need to resolve at best we can hope for an update to their progress. If you notice it was stated the firmware would come out sometime this month I am not sure if it has already or if it is still in progress. Once Wolfson finishes their PR the Foundation will gladly update and include it very quickly. If you are using this Kernel Dom wrote "Note: this tree is aimed at testers. There could be missing kernel modules, or things that don't work. If you find any problems, then report here, or create a github issue." Wolfson was commented on and he replied what is needed. This was less than 30 days ago. "Wolfson has reported losses recently due to volatility in supplying that market. It has been shedding staff to bring its costs down"
That may have something to do with lack of progress on getting the drivers included in the official Raspbian distribution. If the card is not considered a priority by Cirrus then we may be waiting a long time for anything to happen. Wolfson Audio Card Webinar June 12th. I came across the following tweet I am hoping for some exciting news and updates. 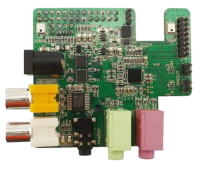 Wolfson invites you to delve into a new dimension of Raspberry Pi audio with the Wolfson audio card accessory. The Webinar will provide you a detailed overview of the Wolfson Audio Card and also show you creative ways of enhancing your Pi Projects with the use of this leading edge Pi accessory. That's encouraging. I guess there will be a period where Cirrus will be reviewing the projects that Wolfson have been engaged in, and decide what they want to do with them going forward. From what I read the Wolfson chief guy is staying on for now to guide the transition. I'm not asking for a newer version of the kernel. I'm asking for the driver to be in tree, or at least to see some progress toward that goal. "My main objection to these modules is 99% of users don't use them, they load by default which takes time and memory, and they mess with gpio lines and i2c which may affect users who are using the pins for other uses. Ideally they would be "opt-in", perhaps with a raspi-config menu setting saying "Support I2S audio cards"." In other words, the Wolfson driver doesn't play nicely with others, and that's why the maintainers won't merge it into tree. To be honest, I'm really disappointed with the software support for this card. In November of last year, Eddie Sinnott from Wolfson posted on this forum, "After a minor glitch with the hardware we've now got boards turning up at the warehouse in their thousands. Main focus now is on getting the software drivers to a level we're happy with before releasing. We're working closely with the Raspbian team as well as the team at Element14 and we'll keep you posted as soon as we have a firmer date." They finally shipped in March, and I bought mine a month and a half ago with the understanding that better software support would soon be forthcoming, but that hasn't happened. The Wolfson Audio card is really a great piece of hardware that's been let down by poor software support. I feel your frustration but your mixing the two all together. The Raspbian images are supplied by the Foundation which has a goal of a teaching platform to be used as educational purposes. Adding a Sound Card by default conflicts with their goal. XBMC repo's are maintained outside of the Raspbian Updates and Packages. I use Raspbmc if the Foundation releases any update Raspbmc has to test and configure this then put out their own environment. If what Wolfson does release works with Raspbian there is no guarantee it will work with the Media Center Builds they then have to work to get it resolved. Ideally one package goes out and it works for everyone. I still have hope. Sometimes no word is good news it means so much time is spent getting it up and out posting theoretical dates and such is useless time spent. Do not I have yet to ever hear them promise, comment, commit that any intended use from their Viewpoint would be as an XBMC Sound Card. Wouldn't a more reliable choice have been an HDMI Audio Splitter? I ask even though I don't know if that would do what you intended. I am trying to review this card and in the past weeks have dug deep to see everything I can to give a non-biased review. I really feel that they have lived up to their promises which has been to do the best they can. The card went out in March to a development platform the delay was due to them wanting to delivery a quality product. That is based on a chip used in smartphones to provide audio capabilities of in and out record voip, etc.. The last update is less than 30 days from both The Raspberry Pi foundation and Raspbmc of which Raspbmc stated he had contact with a developer at Wolfson that said patches are to come. Hold tight I hope it all works out in the end for everyone. But unfortunately we have a lot of trial and error on our end and all have a few products for the Pi that didn't necessarily live up to it's potential but for me those were products from last year. I contacted Wolfson HQ and received this response today. Hopefully they have some good news coming. I will post again once I receive and update. Thanks for your email. I have someone in HQ working on response, and we aim to have it to you tomorrow. My desired setup is XBMC -> Wolfson DAC -> vintage Harman-Kardon receiver. I've tried a $5 USB sound card and it didn't fulfill my needs for several reasons. First, since it runs off the relatively dirty +5V from the Pi, this raises the noise floor to an objectionable level, unless you provide your own dedicated power supply for the USB DAC to run on. Second, since it goes over USB, anything else that goes over USB and generates traffic on that bus (e.g. WiFi adapter, external hard drive) opens the possibility for contention, lag, and skips/pops. (Hence distributions like Volumio that use the RT patch and are highly tuned to avoid this issue.) The Wolfson card, as well as the HiFiBerry, communicate with the Pi using I2S, a dedicated channel that does not suffer from this issue. My desired setup is XBMC -> Wolfson DAC -> vintage Harman-Kardon receiver. This is OpenELEC 4.0 with kernel 3.10.25 and the Wolfson driver plus the "use case" scripts and a few minor modifications so that the Wolfson card should work out of the box. I just uploaded a new build (20140514) based on the OpenELEC 4.0.1 release. This is an experimental build, although it works for me it could well have bugs. Especially USB devices might be problematic due to the old kernel. I don't think the Wolfson driver supports AC3 passthrough, maybe it does, but I can't test it - I'm using only an external stereo DAC. Awesome, thank you so much! I'll give it a try this evening and let you know how it works. This seems very promising and projects upstream by end of June at the latest as that's the last day of Q2. Which should then allow all the Media Center Teams time to implement on their schedule which typically I don't think they sleep much. Hope this alleviates some of the stress and frustration anyone may be feeling. I hope to always give the benefit of the doubt with reputable companies that they hold true and won't release a statement like this unless they were 100% confident in it. Thank you very much for contacting us with regards to the Wolfson audio card for the Raspberry Pi. We are glad to hear that you are a fan of the card and look forward to integrating within projects in the future. With regards to the PR activity for the Raspberry Pi foundation our plans were to release the board with working software which we have now completed and in parallel work on up streaming the device drivers to the Raspberry Pi foundation. We are executing to this plan and will make our software available for up streaming in Q2 2014. I can confirm we are track to achieve this at present. I hope you find the audio capability of the audio card exceeds your expectations, we have certainly found that it adds a completely new dimension to the audio possibilities of the Raspberry Pi. We would of course appreciate any feedback you would like to provide in advance of publishing your review for us to consider. Guys feel free to let me know. Direct Message here I prefer to support@raspians.com if you like please put Wolfson Audio Card (Whatever else) in the subject line and I'll start compiling and researching what is known vs what is yet to be revealed. Put whatever as to what questions you may have as I can't test every single scenario or device. I'll put AC3 passthrough on the list. If you field other questions anywhere else or see other questions I would love the input. "We are currently working with the developers at Wolfson and the RPI Foundation to get the drivers uploaded into the official Raspbian Kernel. We are expecting this work to be completed within the coming weeks and I will update this thread again once this is completed and provide instructions on how to update your standard Raspbian builds to install the new drivers and additional software needed to run the Wolfson audio card." That was posted by Andy Laing on March 24th. Note he said that they were expecting the work to be completed 'within the coming weeks'. You would have thought therefore that 6 or 7 weeks later we should not still be waiting for something to happen, and with no further word from Wolfson or Element14 (until you prodded them). I'd take 'within the coming weeks' to mean 2 or 3 weeks, not 6 or 7. Or indeed probably more weeks yet to come. That sounds like 'months' to me. I agree, this is ridiculous. I bought the card with the understanding that the drivers would be in the kernel within weeks. I am now still waiting. Worth the wait, WAC sound better than the hifiberry plus the internal class D amplifier drive loud speakers with no issue , gone thru all the testing, ready to set up my whole house audio. I don't think anybody here thinks the Wolfson isn't a good product, it's just that the good work that has been done on it is being let down by poor support. The huge 4.4GB ZIP file which doesn't unzip with standard tools (does work with 7-zip) is based on NOOBS with Raspbian. It's running a 3.10.25 kernel with the modules added for the Wolfson support. It's running RPI firmware (/boot files) from January 6th. There's no easy way to update that without pulling the kernel source and building your own with the Wolfson modules included. The software is based on Raspbian Wheezy, what happens when The Raspberry Pi Foundation move to Raspbian Jessie? That 4.4GB ZIP file wouldn't fit on a brand new (£13 high spec Samsung 8GB card from Maplins). It needs to have NOOBS removed (to shrink it by 1.2GB) or it needs the Raspbian root filesystem squashed down by 500MB so it's guaranteed to fit any 8GB card. It's not difficult to extract the Raspbian extended partitions from a NOOBS card and move them back to primary partitions (but why should I have to do that). Most hardware add-ons have an Raspbian DEB file that you download and add to your existing system. No special card, no special kernel needed. There must be a way to make the Wolfson kernel modules agnostic to the kernel version (within reason, it may need to be tied to a major version 3.10.? vs 3.12.?). I don't want to be forced to stick with a 3.10.25 kernel (what happens if the next Heartbleed exposure is in a kernel module, what happens if I get some other hardware that needs additional kernel support (albeit I'll have the same discussion with them)). Well, the 4.4Gb download was supposed to be only a temporary solution, not a permanent one. Towards the end of March we were told that work was being done to get the Wolfson drivers included in the standard Raspian distribution 'in the next weeks'. However, we are still waiting for that. The drivers weren't included in the recent Raspian update. If the drivers are included in Raspian then presumably you can do a normal update. If the foundation moves to Jessie then a further update will be required (for the Wolfson driver). It's not a satisfactory situation,and this is what we are complaining about. I don't know if we've ever had a comment from Wolfson in this forum, and certainly precious few from Element14. Have you noticed that Ragnar Jensen has already produced a stripped-down version of the Wolfson download? A number of us are using that. I am using Ragnar's RaspbianW version. That was a much less painful download on my slow ADSL line. I'm thinking about building on my Raspbian Jessie (yes I'm running that early) with the 3.12.19+ kernel, but that's going to be a set it going at bedtime project. Works great, and to top it all off, my USB WiFi dongle works out of the box (I had to compile a kernel module for it before). Thanks!